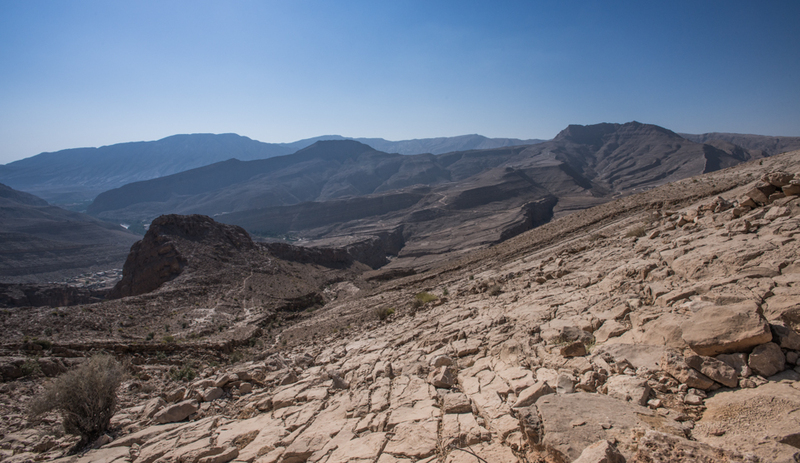 Last week I finally managed to get out and do the Wadi Tiwi to Wadi Bani Khalid trek with the Oman Mountain Club. It’s a pretty easy walk, if long, with stunning views at every turn along the way. Doing it this way takes you from the seaward facing Wadi Tiwi, up and across the Eastern Hajar mountains and back down to the Northern Edge of the Wahiba Sands through the scenic Wadi Bani Khalid. 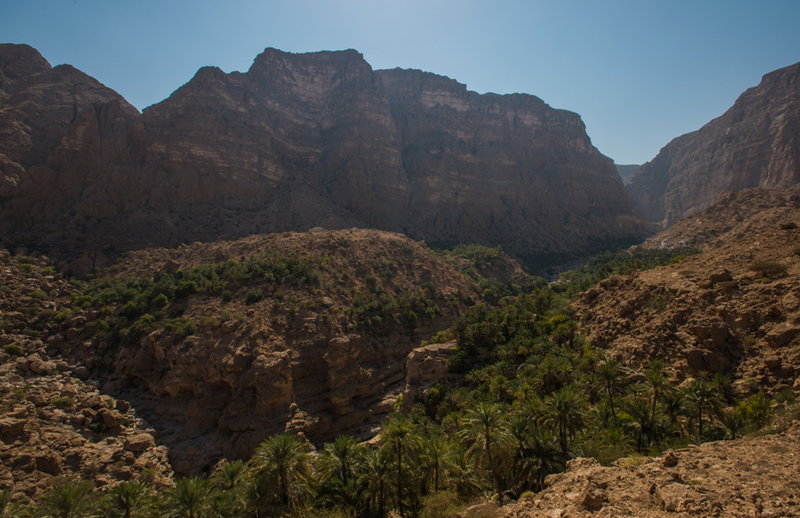 The ascent starts immediately with a relatively steep climb out of Wadi Tiwi, revealing the lush plantations around Saymah at the head of the wadi. From there on, the donkey path wends its way slowly upwards through some wonderful, isolated gullies towards the plateau on top. We were lucky enough to spot a mountain gazelle (gazella gazella muscatensis) in one such area, however it started immediately having seen us and sprang away in a deft display of agility and disregard for the precipitous fall below. Reaching the plateau the trekking path runs alongside a newly built graded road coming up from Qalhat which enables vehicle support and a more comfortable overnight camp if desired. Sleeping outside at just over 2000m, I found the night to be surprisingly cold at the start of November and was glad of my down sleeping bag. After a chilly start the next morning, a short further climb takes you to the top of the ridge and the highest point of the trek. On a clear day it is possible to see both the golden sands of the Wahiba ahead and the azure blue of the Gulf of Oman behind you from the top of this ridge. The view of Wadi Bani Khalid from above is breathtaking. After a long but gentle descent we were relieved to finally arrive at the tranquil pools of Wadi Bani Khalid. A swim in the cool spring water was the perfect restorative after a couple of long days on the mountain. The signpost at the start of the walk lists the walk as 28km long, however we measured 41km end to end with our GPS. The GPS also showed the net ascent on day 1 was approximately 1900m from the start point at an altitude of 150m to the campsite beneath the ridge at 2050m. The highest point reached the following day was 2150m. Many thanks to Abdullah Al Muqimi and the Oman Mountain Club for organising the trek. Also a report on the hiking route is being prepared for The Week national newspaper so keep your eyes peeled for that. This entry was posted in Hiking.